Let me start by saying that I like snakes. I don't exaggerate size or aggression. I'm not afraid of them. In college I had an Eastern Coral snake. I picked up Copperheads and moved Cottonmouths and big rattlers. 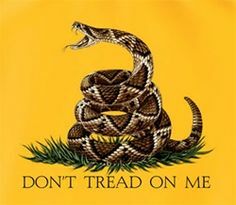 Venomous snakes deserve my respect and distance. I have scolded many people (friends and strangers alike) for killing non venomous snakes on several occasions. I have never purposely killed or wanted to kill any snake...until the day of this encounter. OK. It was a Friday afternoon(July 8, 2016). The camera was finally loaded with batteries, sim chip and memory card. It was finally working perfectly, sending email images within 2 minutes of taking a picture. It was in the small backpack heading up the mountain into the forest. I was going to the camera location called “Quebrada”(ravine). A creek had caused a small ravine over which a tree had fallen. The place had recently been a good spot for a camera trap. The trail was well defined (steep slopes, up and down on each side) caused animals to follow the path or cross the ravine on the tree trunk. A male Curassow follows the alternate path. The above camera(Covert), took some great pictures, but had failed over the previous months. I decided that this was a perfect time to replace the Covert with a new Spartan wireless camera. The walk had been easy and uneventful. I was in a semi hurry as to get back home in time for a quick rest and a shower. We would head to Banana Bay Marina for the happy hour which is our custom on Friday afternoons at five-ish. I strapped the camera to the tree and and looked across the ravine. There were a few plants growing that needed to be chopped so the motion sensor eye would not be tricked and accidentally triggered by rogue breezes. I also wanted to test the range and orientation of the new camera's placement before I left. Casual Friday. 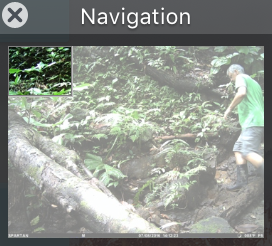 Here I am on the way back to clear vegetation and test the orientation of the camera. I left my knapsack with phone, water etc at the base of the tree which held the camera. I crossed over the quebrada with a steep uphill on my right and the steep downward slope on my left. As I got to my destination(the far end of the log), I heard my walkie talkie go off, my wife Kate was asking a question. I started to fiddle with the walkie then began answer her question. Suddenly, behind me, to my right, slightly up the hill I heard a ruckus in the leaves. As I spun around, I saw a huge Fer-de-lance/Terciopelo, large head raised, mouth agape, fangs prominent twisting and lunging towards me down the slope with full momentum. The snake, from it's elevated position, could easily have struck my leg, thigh, or waist. My 10 inch boots were of no help to me in my position. Fascinated by snakes, especially a large individual such as this, after 4-5 quick paces I slowed to watch and observe. The snake would have none of that. It reached the level trail and and continued after me…mouth agape body flailing barely touching ground as it advanced towards me. The damn snake was trying to kill me! My desire to observe vanished. It was fight or flight. I had a machete, but it would have been no match for a fast twitch beast such as this. My only hope was to out run it. Running in the jungle in never a good idea especially with a machete. At home I run on streets, not paths with steep crumbling edges. I wear light running shoes not awkward rubber boots. I never run with a 20 inch machete. The walkie talkie went off again with Kate asking her question. I answered bluntly and I sounded panicked, which she picked up on. I slowed my retreat to realize the predator had stopped somewhere along the trail. Whew. I stared at the trail 2 feet from me, then 3 feet, then 5 feet, then 9 feet etc until I saw my orange knapsack waiting for me beside the tree with the camera. I had to go past that damn snake again. Seeing a snake of this size and ferocity is frightful enough, but knowing it is very near and not seeing it was almost paralyzing. 14 Minutes after the snake encounter, I had almost made it back to the camera. I took my rusty dull machete, felled a rainforest sapling, trimmed the tiny branches until I had a 7 foot stick. I began sweeping it over the uphill on my left the level trail, and the right downward slope. All the while I was hoping to alarm my nemesis again and to identify its whereabouts. 14 minutes of ‘sweeping’ passed as I made it to the rocky ravine. 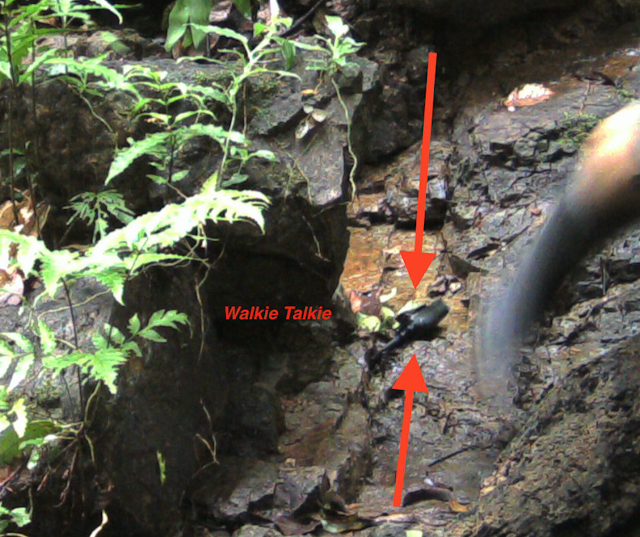 As I hopped over, my walkie-talkie fell from my belt onto the bare rock creek bed. Yikes..My Walkie Talkie in a shadowy danger zone. I had to reach for it near several rocky snake hiding places. The grab was successful. Still shaky, I realigned the camera and grabbed my backpack. Of course, then I had to cross the quebrada and go right past the irate serpent again. Stick in hand, I once more tried to scare it out of hiding. One step..then two steps then 4 then 8 and more until I had made it past the Terceopelo a fourth time. It had vanished or became docile to animals bigger than itself as is the norm. I checked in on the walkie and had an uneventful 10 minute walk back poking over every log along the way with the machete. I started to wonder, "Did all this really happen...to me?" Yes, it did. I felt like a guy who survived a late night knife assault in a silent dark alley: terrified but relieved. Despite my safe return, story of fear and then triumph, the damn snake scared me. I now wonder what is under the sofa, inside a dark cabinet, around the driver side tires as I step into the car. These are all places that a Fer-de-lance could be even though I fully know it is quite unlikely. This Friday in the woods changed me, possibly forever. For the first time in my life, I wanted a snake to be killed. This felt strange. Kate and I and others, including our dog walk the trail several times a week. This was absolutely not the place for a hyper aggressive highly venomous snake to be. I recounted my tale with permanent area residents over the next few days. None had ever encountered such aggression from an undisturbed snake. Theories abounded such as mating season, young protection, recent kill of prey animal, shedding time, none of it made any real sense to me. A snake this aggressive that is living in a healthy forest of large mammals would litter the forest with their bodies or be eaten or killed by one of its predators. I had written the above narrative a few days after my encounter and initially planned to end it there. Eventually, I downloaded the images from the camera and began to wonder: Can I see the damn snake? 14 minutes of Hell later, the snake is missing. So you see, the head is up the slope and the tail likely extends a ways towards the end of the fallen tree well out of frame. While the extreme zoom from a long way gives no scale for size. The apparent length in frame is consistent the the nearly hand sized open mouth the snake showed me as it sprung up from the leaves and vegetation. X marks where the snake was probably initially coiled...waiting. Initially, I passed over or near the snake near the end of the tree on my way to set up the camera. This is a perfect place for a snake to coil and await prey. Perhaps I startled it and caused it to ascend the hill. When I went back to clear the vegetation I got the call on the walkie. Instead of paying attention to where I stepped, I was pulling the walkie from my belt and attempting to answer. I may have brushed or perhaps stepped on the back end if the Fer-de-lance as it extended onto the trail to the base of the fallen tree. At the time, that it became irritated enough to 'attack with mouth open', it doubled over itself and easily came down to the side of the trail. If I was on it's tail it certainly almost had to come at me. This apparently can explain the violent aggression. I still don't know why it continued after me when I was 7-8 feet away or why it followed me down the trail 3 meters or so after I was no longer a threat. Furthermore, I had to pass by the snake two more times after the initial melee. Both times the snake was invisible or gone, meaning that in the four times we crossed paths, only one was an aggressive encounter, probably initiated on my behalf. When I understood all of this, I lost my desire for its death. It was just a natural reaction after all. July in Costa Rica is part of the wet season. Heavy rains and cooler temperatures cause snakes to move around a bit more than in the dry season. However, this July, on the second day of our trip, this Terceopelo was the only one we encountered for the full 25 days of our visit. That is unusual! Coming full circle...I walked past that spot 15 more time at least over the next few weeks. I kept a wary eye for my friend, but he was gone or never showed himself. So I'll let him peacefully eat all the rats in the forest and we will agree to keep our distance from each other through our new found mutual understanding. I made the GIFs in this blog from a Discovery Channel show about some of the snakes in Southern Costa Rica. It is worth a watch in its entirety. Only the last part is about the Terciopelo and I used this as it shows the correct size of snake that I encountered. Start at the 31:13 minute mark to see the Fer-de-lance.